Anthony Skillman named Jimmys Award winner! 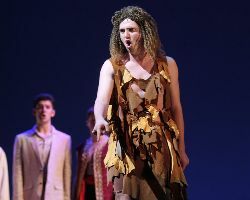 Anthony Skillman was named as the best actor in this year’s national musical theater competition. Tustin teenager Anthony Skillman made a big splash on Broadway this week, receiving the award for best high school actor in the United States at the National High School Musical Theater Awards in New York. 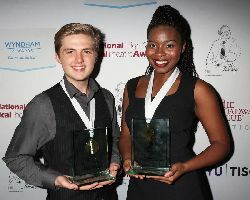 Skillman, 18, was honored Monday night at the ceremony, nicknamed the Jimmy Awards after theater owner James Nederlander. Marla Louissaint of New York City was named best actress. Skillman attended as a representative of the Childress M.A.C.Y. Awards which chose Skillman in May during their annual musical theater awards ceremony at the Segerstrom Center for the Arts in Costa Mesa. 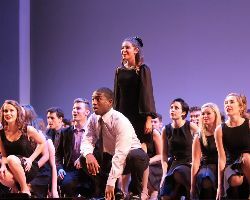 For his solo performance during the awards show, Skillman sang “It Don’t Make Sense” from Jason Robert Brown’s musical “Parade.” Only the top six finalists were invited to sing solos during the ceremony. Skillman and Louissaint each will receive a $10,000 scholarship award, capping a months-long winnowing process that began with 50,000 students from 1,000 schools and ended at the Minskoff Theatre, the long-term home of “The Lion King,” which doesn’t perform on Mondays. The winners are also eligible for a four-year merit and a need-based scholarship to attend the New Studio on Broadway, New York University’s Tisch School of the Arts department of drama, contingent on their acceptance into the program. Morgan Higgins of Mission Viejo was the best actress representative sent to New York by the Childress M.A.C.Y Awards and she was among the top four runners-up who will each receive $2,500. This is the first time that two finalists from the same regional awards program were also named in the final six in New York. “Hearing him say my name made me freak out a little bit,” Skillman said. Since the Nederlander Organization started handing out the Jimmys in 2009, Orange County students have taken the top prize four of the past seven years. The previous three winners, Kyle Selig (2010), Elizabeth Romero (2012) and Sarah Lynn Marion (2013) were all students of the Huntington Beach Academy for the Performing Arts. Skillman graduated this year from Orange Lutheran High School in Orange and Higgins graduated from St. Margaret’s Episcopal School in San Juan Capistrano. Skillman was also among the Top 10 vocal music Orange County Register Artists of the Year in 2014 and 2015. During his final audition for Artist of the Year this year, he sang “Corner of the Sky” from the musical “Pippin” and said that Pippin is a dream role. The 52 teens who made it to New York this year – 26 girls and 26 boys – got a five-day theatrical boot camp at NYU, complete with scrambling to learn an opening and closing group number, putting together medley numbers, and getting advice on solo songs. When Skillman ran into some of the judges at the after party at John’s Pizzaria in Times Square, they said they would to continue to watch his progress as a performer, even in far away Texas. They encouraged him to keep in touch and promised to help him make a smooth transition to performing in New York once he finished his education.